The name “basil” comes from the Greek word “basilikohn” which means royal. Basil has held its royal status in other cultures as well. In India, basil was cherished as an icon of hospitality. In Italy basil was considered a symbol of love. Basil is a highly fragrant plant whose leaves are used as a seasoning herb for many different types of foods. Basil has rounded leaves that are usually pointed. Basil leaves are usually a rich green colour but some varieties feature hints of red or purple. Basil looks a little like peppermint, which is not surprising since they belong to the same plant family. There are over 60 varieties of basil and they all differ somewhat in appearance and taste. A few of the unique tastes are lemon basil, cinnamon basil, anise basil and sweet basil. 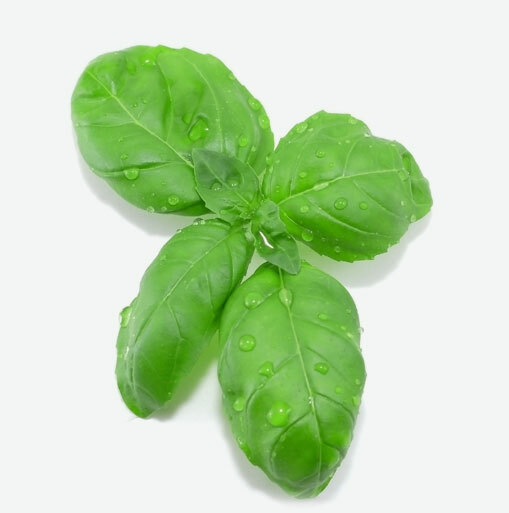 The green leaves of the basil plant are very nutritious. Basil is a good source of magnesium which promotes heart health by helping the muscles and blood vessels relax which in turn improves blood flow. Magnesium also lessens the risk of irregular heart rhythms or heart muscle spasms. Basil also provides calcium which is important for strong bones. If fresh basil is available, choose it over the dried form of the herb because its flavour is far more superior. Fresh basil leaves should look vibrant and be a deep green in colour. Avoid leaves with dark spots or yellowing. Store fresh basil in the refrigerator wrapped in a damp paper towel. You can freeze basil whole or chopped in zip lock freezer bags. Rinse basil leaves well before cooking with it. Mix fresh chopped basil with garlic and olive oil to make a dairy-free pesto that can be enjoyed with pasta, on top of salmon or brushcetta. Add basil to salads, soups and sauces. Bake basil into breads and buns or use as toppings on pizzas.